Hate to leave your pet behind while you vacation? 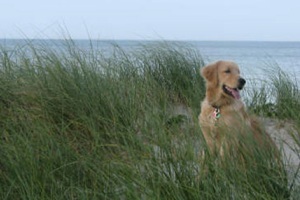 You might be surprised to learn that the Islands and Cape Cod rentals are pet friendly. Currently, 628 Cape and Islands properties, or 21% of our homes, accept pets. And the number is steadily growing. The trend is due to a number of factors including the fact that pets have become members of our families and, as such, vacationers are loath to leave them behind. The financial and logistical costs of kenneling pets or making other boarding arrangements for them contribute to the trend as well. Many homeowners own pets themselves and thus are sensitive to the needs of their tenants. And, of course, they appreciate the competitive edge allowing pets can give them over homeowners that don’t. Barnstable: Dogs are allowed on Barnstable public beaches from September 15 to May 15 only. Sandy Neck, a coastal barrier beach, offers public beach, an off-road vehicle beach, and hiking trails. Dogs are allowed on Sandy Neck hiking trails and the ORV beach throughout the year, as long as they remain on a leash. Brewster: Dogs are allowed on the beach only during the off-season, from October 1 through May 1. 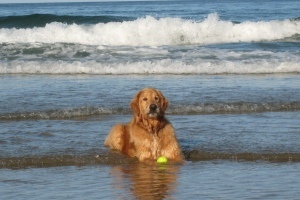 During the summer, pets are not permitted on lifeguard-protected beaches. Passing through to unprotected areas of the beach is permitted. During shorebird nesting periods, pets are not permitted in posted locations. Passing through these areas is prohibited. Pets are not permitted on designated nature trails, certain bike trails, and fresh water ponds within Cape Cod National Seashore (beaches and water), May 15 through October 15. 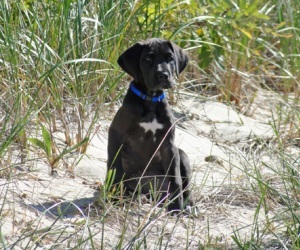 Chatham: Dogs are allowed on beaches only during the off season from September 16 to March 31. However, dogs are welcome at Jack Knife Harbor Beach on Pleasant Bay, which is shared between North Chatham and Harwich, during the summer months before 9 AM and after 6 PM. Dennis: Dogs are allowed on the beach only during the off season from Labor Day-Memorial Day. Eastham: Dogs are permitted on bayside beaches after Labor Day and until June 15. On the National Seashore beaches, dogs must be leashed and under control at all times. They are not permitted in public buildings, picnic areas, on lifeguarded beaches, self-guiding trails, or in locations posted as shorebird nesting areas. Dogs are allowed on the Cape Cod Rail Trail. Falmouth: Dogs are allowed on the beach only during the off season October 1 through April 30. Harwich: Dogs are allowed on the beach only during the off season Labor Day -- Memorial Day. 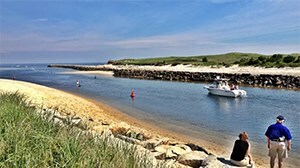 However, dogs are welcome at Jack Knife Harbor Beach on Pleasant Bay, which is shared between North Chatham and Harwich, during the summer months before 9 AM and after 6 PM. Orleans (Nauset Beach): From a point South of Nauset Beach parking lot to trail one, dogs are prohibited. From a point South of trail one to the Chatham inlet, all dogs must be on a leash of not more than 30 feet at all times, unless below the high tide mark. Both of these regulations are in effect from May 15 through Labor Day. Dogs are prohibited from areas closed to vehicular or human traffic for Piping Plover protection. 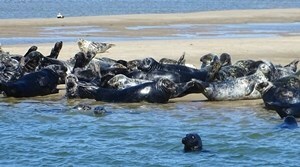 Provincetown: Beach access on public beaches for dogs is from 6AM to 9 AM and 6PM to 9PM during the summer. Sandwich: Dogs are allowed on the beach, on a leash, only during the off season October through March. Wellfleet: Dogs are allowed, on a six-foot leash, before 9 AM and after 5 PM on Duck Harbor, Newcomb Hollow, Cahoon Hollow, White Crest and Maguire Landing beaches from the 3rd Saturday in June through Labor Day. The Cape Cod Canal Trail is a paved path along the scenic Cape Cod Canal for walking, biking or inline skating, and it allows leashed dogs. The Cape Cod Rail Trail, running from Dennis to Wellfleet, is a paved hiking and biking trail and allows leashed dogs throughout the year. 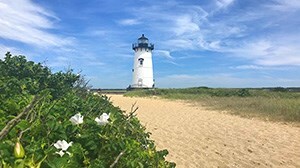 The Cape Cod National Seashore allows dogs to be exercised on the West and Sunset Horse Trails in the Provincelands or on the Head of the Meadow Bike Trail in Truro. Nickerson State Park in Brewster allows leashed dogs on its nature trails and permits them access to Flax and Cliff Ponds in the park. Green Briar Nature Center in Sandwich allows leashed dogs on the nature trails and throughout the trails in the flower garden. Pets are not allowed inside the buildings. The adjacent 166-acre Briar Patch Conservation Area also allows dogs on their trails. Pets must be on leash, except during the months of September through March, when dogs are allowed off-leash, but must be under voice control. The Barnstable, Dog Park is located next to Hathaway's Pond at 1431 Phinney's Lane. The park opened on October 31, 2018 and it is available to the public dawn to dusk - unless closed for weather conditions or maintenance. The park has three off leash areas: the training area, the small dog area and the mix use area. All areas have a rice stone covering, water bubblers, waste disposal stations and benches. Note: during the winter months the water is turned off. In Dennis, dogs can find friends at Fresh Pond Dog Park, which has two fenced enclosures, a walking trail and freshwater swimming. It's a short but scenic pondside stroll through the woods, a nice place to stretch your legs after too much lying in the sun or on the couch. The dog park is on Rte 134 between the traffic lights at Upper County Rd and the lights at Rte 28. In Provincetown, Pilgrim Bark Park caters to dogs on an acre of land with six-foot fences and double gates. The park is divided into two parts, with one area reserved for small dogs. To reflect the town's rich appreciation for the arts, local artists designed benches (including a small-scale version of the Pilgrims' Mayflower ship), poop bag stations, kiosks, signage and a super-sized doghouse at the park's entrance. Three fire hydrants painted to look like canine versions of Provincetown's police officers, firefighters, and public workers sit sentry outside the park. It is located at the corner of Shank Painter Road and Rte 6 with parking on the Rte 6 side. In Falmouth, the Falmouth Dog Park is a 1.6 acre site, with two fenced play areas for the dogs. The “Small Dog” area is 3,264 sq. ft, and the “All Dog” area is is 16, 760 sq. ft. Both areas are covered with pea stones and have people benches, water bubblers, and waste disposal cans. It is located at 257 Brick Kiln Road. Open from dawn to dusk, the Yarmouth Dog Park is located at the Sandy Pond Recreational Area and was opened in 2015. For more information, take a look the Yarmouth Dog Park facebook page. The Mashpee Dog Park opened in the summer of 2015 and offers a large space for not just dogs, but the owners as well! The Mashpee Dog Park is maintained with the assistance and financial support of the Friends of Mashpee Dog Park. Check out their website for more information. The two main options for getting to the Islands are to take a ferry or a plane. Your leashed dog travels for free with all the ferry companies and for a reasonable fare each way by plane. 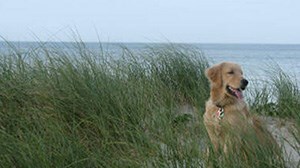 Dogs are allowed during the summer on Nantucket beaches with lifeguards only before 9 AM and after 5 PM. On beaches that have no lifeguards, or during the winter months, dogs are allowed all day on the beach but must always be leashed. Before you go, always verify the seasonal dates and times when dogs are allowed on the beach. Each Conservation Commission-owned walking trail begins with a plastic baggie dispenser for your convenience to take along for easy clean ups. Trails include New Masquetuck Trail, New Field Station Trail, The Middle Moors, Sanford Farm, Squam Farm Walking Trails, and Windswept Cranberry Bog. Tupancy Links Trail is the best place for a good Frisbee toss and provides a basket of tennis balls for your dog's enjoyment. Do return them to the basket for the next dog to enjoy. Well behaved, leashed dogs travel for free on the Nantucket Regional Transit Authority (NRTA) shuttles. April 1 - May 14: All dogs or pets must stay at least 100 yards from protected and posted nesting habitats. May 15 - August 30: All pets are prohibited on all beaches from 9 AM to 5 PM. At other times, all dogs must stay at least 100 yards of protected and posted nesting habitats. September 1 - September 16: Dogs and pets are prohibited on area beaches between 9 AM to 5 PM. You are required to clean up after your pet and properly dispose of bags or containers. Violating these restrictions carries a $50 fine. Martha’s Vineyard’s many preserves and farms welcome dogs and, as usual, require clean up and that you keep your dog under voice command if off leash. Trade Wind Fields Preserve - Oak Bluffs. At Manuel F. Correllus State Forest, leashed dogs only are allowed.